Harvard Medical School (HMS) is the graduate medical school of Harvard University. It is located in the Longwood Medical Area of the Mission Hill neighborhood in Boston, Massachusetts. Founded in 1782, HMS is one of the oldest medical schools in the United States and is consistently ranked 1st among research-oriented medical schools by U.S. News and World Report. Unlike most other leading medical schools, HMS does not operate in conjunction with a single hospital but is directly affiliated with several teaching hospitals in the Boston area. The HMS faculty comprises of approximately 2,900 full- and part-time voting faculty members consisting of assistant, associate, and full professors, and over 5,000 full- and part-time, non-voting instructors. The majority of the faculty receive their appointments through an affiliated teaching hospital. 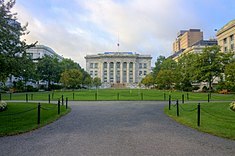 Harvard Medical School was founded on September 19, 1782 after President Joseph Willard presented a report with plans for a medical school to the fellows and the president of Harvard College. It is the third-oldest medical school in the United States, founded after the Perelman School of Medicine at the University of Pennsylvania and Columbia University College of Physicians and Surgeons. The founding faculty members of Harvard Medical School were John Warren, Benjamin Waterhouse, and Aaron Dexter. Lectures were first held in the basement of Harvard Hall and then later in Holden Chapel. Students paid no tuition, but purchased tickets to five or six daily lectures. The first two students graduated in 1788. In the following century, the medical school moved locations several times due to changing clinical relationships; a function of the fact that Harvard Medical School does not directly operate or own a teaching hospital. In 1810 the school moved to Boston at what is now downtown Washington Street. In 1816 the school was moved to Mason Street and was called the Massachusetts Medical College of Harvard University in recognition of a gift from the Great and General Court of Massachusetts. In 1847, the school was moved to Mason Street to be closer to Massachusetts General Hospital. In 1883 the school was relocated to Copley Square. Prior to this move, Charles William Eliot became Harvard's president in 1869 and found the medical school in the worst condition of any part of the university. He instituted drastic reforms that included raised admissions standards, formal degree program, and defined it as a professional school within Harvard University that laid the groundwork for its transformation into one of the leading medical schools in the world. In 1906, the medical school moved to its current location in the Longwood Medical Area. The Longwood campus's five original marble-faced buildings of the quadrangle are used for laboratories, amphitheaters, and research space. Discovery of the cause of preeclampsia. In mid-1847, Professor Walter Channing's proposal that women be admitted to lectures and examinations was rejected by the President and Fellows of Harvard College. Nonetheless, Harriot Kezia Hunt was soon after given permission to attend medical lectures, but in 1850 this permission was withdrawn. In 1866 two women with extensive medical education elsewhere applied but were denied admission. In 1867 a single faculty member's vote blocked the admission of Susan Dimock. In 1872 Harvard declined a gift of $10,000 conditioned on medical school admitting women medical students on the same term as men. A similar offer of $50,000, by group of ten women including Marie Elizabeth Zakrzewska, was declined in 1882, a committee of five was appointed to study the matter. After the medical school moved from North Grove Street to Boylston Street in 1883, professor Henry Ingersoll Bowditch's proposal that the North Grove Street premises be used for medical education for women was rejected. In 1943 a dean's committee recommended the admission of women, the proportion of men and women being dependent solely on the qualifications of the applicants. In 1945, the first class of women was admitted; projected benefits included helping male students learn to view women as equals, increasing the number of physicians in lower-paid specialties typically shunned by men, and replacing the weakest third of all-male classes with better-qualified women. By 1972 about one fifth of Harvard medical students were women. In 1850 two black men, Daniel Laing, Jr. and Isaac H. Snowden, were admitted to the school, but they were later expelled under pressure from faculty, and other students, who objected. In 1968, in response to a petition signed by hundreds of medical students, the faculty established a commission on relations with the black community in Boston; at the time less than one percent of Harvard medical students were black. By 1973 the number of black students admitted had tripled, and by the next year it had quadrupled. Harvard Medical School has gone through many curricular revisions for its MD program. In recent decades, HMS has maintained a three-phase curriculum with a classroom based pre-clerkship phase, a principal clinical experience (PCE), and a post-PCE phase. The pre-clerkship phase has two curricular tracks. The majority of students enter in the more traditional Pathways track that focuses on active learning and earlier entry into the clinic with courses that include students from the Harvard School of Dental Medicine. Pathways students early gain exposure to the clinic through a longitudinal clinical skills course that lasts the duration of the pre-clerkship phase. A small portion of each class enter in the HST track, which is jointly administered with MIT. The HST track is designed to train physician-scientists with emphasis on basic physiology and quantitative understanding of biological processes through courses that include PhD students from MIT. Admission to Harvard Medical School's MD program is highly selective. There are 165 total spots for each incoming class, with 135 spots in the Pathways curriculum and 30 spots in the HST program. While both use a single application, each curricular track independently evaluates applicants. For the Class of 2022, roughly 7,000 candidates applied and fewer than 900 were interviewed. Approximately 3.4 percent of applicants were offered positions in the incoming class with a 72% matriculation rate. Harvard Medical School does not directly own or operate any hospitals and instead relies on affiliate hospitals for clinical education and patient care. While medical students can spend time at any of the affiliate centers, they primarily complete their clinical experiences at Beth Israel Deaconess Medical Center, Brigham and Women's Hospital, Cambridge Health Alliance, or Massachusetts General Hospital. Babak Azizzadeh Facial surgery specialist and surgeon for Mary Jo Buttafuoco after she was shot by Amy Fisher in 1992. Alice Hamilton first female faculty member at Harvard Medical School. Mildred Fay Jefferson Pro Life Activist; first African American woman to graduate from Harvard Medical School. Richard Starr Ross Dean Emeritus of the Johns Hopkins School of Medicine, Baltimore, MD, Former President of the American Heart Association. ^ a b c d "The History of HMS". hms.harvard.edu. ^ "US News Harvard University". ^ a b Morison, Samuel Eliot (1930). The Development of Harvard University since the inauguration of President Eliot, 1869-1929. Cambridge, Massachusetts: Harvard University Press. pp. 555–594 & Preface. ^ "Harvard Medical School — History". Archived from the original on May 5, 2007. Retrieved February 25, 2007. ^ "Countway Medical Library — Records Management — Historical Notes". Archived from the original on September 1, 2006. Retrieved February 25, 2007. ^ "History of Harvard Medicine". Retrieved August 4, 2017. ^ a b c Beecher, Henry Knowles (1977). Medicine at Harvard : the first three hundred years. Hanover, N.H.: University Press of New England. pp. 460–481. ^ "John R. Adler, MD | Stanford Medicine". med.stanford.edu. Retrieved March 26, 2015. ^ "Dr. Harold Amos, 84; Mentor to Aspiring Minority Physicians". Los Angeles Times. March 8, 2003. Retrieved April 11, 2018. ^ "Arie Belldegrun M.D. | David Geffen School of Medicine at UCLA". People.healthsciences.ucla.edu. Retrieved June 27, 2013. ^ Pearce, Jeremy. "Dr. Ira B. Black, 64, Leader in New Jersey Stem Cell Effort, Dies", The New York Times, January 12, 2006. Retrieved August 13, 2009. ^ Saxon, Wolfgang. "Hallowell Davis, 96, an Explorer Who Charted the Inner Ear, Dies", New York Times, September 10, 1992. Accessed July 19, 2010. ^ Murray, Joseph E. M.D., Plastic & Reconstructive Surgery, October 2004, Volume 114, accessed March 20, 2011. ^ "MTV Original TV Shows, Reality TV Shows - MTV". Retrieved February 16, 2017. ^ Business Daily Africa (2017). "Top 40 Women Under 40 in Kenya" (PDF). Nairobi: Nation Media Group. Retrieved November 22, 2017. ^ "Jill Stein (G-R) Candidate for Governor". Retrieved May 31, 2016. ^ Grosfeld, Jay L.; Othersen, H. Beimann. "A tribute to Orvar Swenson on his 100th birthday". Journal of Pediatric Surgery. 44 (2): 475. doi:10.1016/j.jpedsurg.2009.01.004. ^ "Tyrance Earns Spot in Academic All-America Hall".